Three comprehensive transportation corridors meet in Wuhan . Recently, the State Council printed and issued a development plan for the comprehensive transportation system in China, specifying buiding Wuhan into one of China’s twelve international comprehensive transportation hubs. The plan referred to Wuhan for ten times, including in the fields of railway, waterway, highway and airway. 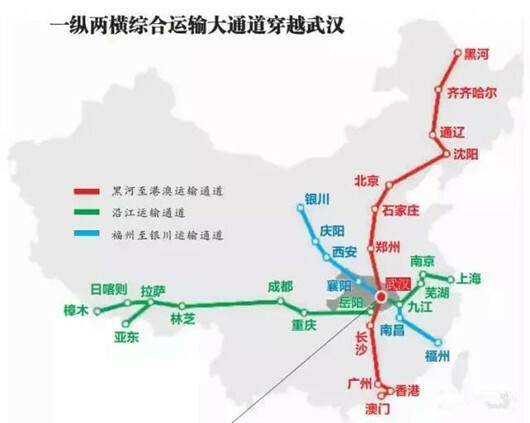 In terms of comprehensive transportation, Wuhan will be a transport node where three corridors meet; as for railway, Wuhan is to enjoy a high speed rail connecting Wuhan and Shiyan; as for civil aviation, Wuhan Tianhe Aiport wil be expanded; as for water transportation, the training works of the Yangtze River between Wuhan and Anqing, the construction of railways and highways linking the ports, the construction of Wuhan cruise terminals will be implemented and the building of Wuhan Yangtze River Shipping Center will be speeded up. Accoding to Wuhan Municipal Transportation Commission, in 2016, Wuhan opened five International passenger and freight air routes, and boasts a total of 41 international and regional air routes with passenger throughput up to 2.3 million people, maintaining the leading status for four consecutive years in central China. The bi-directional rates of actural loading for China-Europe (Wuhan) freight trains reached 95.48 percent, the No.1 in China. The four shipping lanes, river-to-sea, Luzhou-Wuhan-Taiwan, Wuhan- ASEAN countries (Thailand, Cambodia, Vietnam and Laos) and Wuhan - Japan, South Korea have been totally run 798 shifts, a year-on-year growth rate of 10.8 percent. In 2017, Wuhan plans to complete 56 traffic projects, start 21 and advance 50, with intention to complete transportation infrastructure investment of 41 billion yuan.